ECONOMIST Leroy Laney, speaking at First Hawaiian Bank's annual business outlook forum yesterday, forecast a positive future for the state, and said economic indicators are still strong. A construction boom is continuing to change the face of the islands as lower interest rates have made building more affordable. Real estate values are rising. Businesses are creating jobs, people are getting hired and they're buying homes and cars. 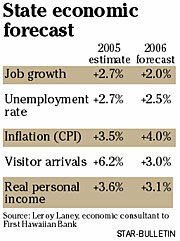 "After emerging from the doldrums of the 1990s, Hawaii in 2005 is in its ninth year of economic expansion," Laney said. "Things continue to look upbeat for 2006 as well." Outside of Hawaii there are plenty of reasons to be "cautiously optimistic" about the U.S. and global economic outlook as well, said guest speaker Michael Boskin, a Stanford University professor and former chairman of the President's Council of Economic Advisors. "The U.S. is the only major industrialized economy growing at a good pace," Boskin said. However, Boskin cautioned that the personal income of U.S. consumers has declined and that could have a slowdown effect on the economy. "Consumers will have to build up their balance sheets, especially as we see less housing appreciation," he said. In Hawaii, an ever-tightening labor market could slow job creation, and confidence could be affected by high housing costs and inflation, said Laney, economics consultant to the bank and professor of economics and finance at Hawaii Pacific University. "In fact, Hawaii now has the tightest labor market of any state in the U.S.," Laney said. "Hawaii's labor shortage now spans all sectors and all job levels." Rising home prices and limited availability of housing across all the islands also trouble him. This year's job growth may exceed 2004's, but eventually a lack of labor supply will kick in, causing a lower 2 percent forecast for next year, he said. "Hawaii's jobless rate is already lowest in the nation and nothing in the near term suggests that the tight labor market will ease. The projection for 2006 is 2.5 percent," Laney said. The state's dominant visitor industry will grow another 3 percent and the construction industry will post gains of about 3.1 percent, he said. Personal income growth is in its ninth year of expansion and while credit card spending slowed somewhat during the first half of 2005, consumer confidence remains high across the state, Laney said. Inflation will rise to 4 percent as oil and housing costs will continue increasing, while inflation-adjusted personal income will grow by a healthy 3.1 percent, he said. Hawaii excise tax revenues, which often account for more than half of the state's general fund, surged 15 percent during the first six months of the year from the same time last year. New car and truck sales climbed for the fourth straight year, he said. "New car and truck sales are an important sector, and a good indicator of Hawaii's propensity to buy big ticket items," Laney said. "This year, the projection is for a slight increase. But rates of growth are leveling off, a sign of some cooling and saturation of the market."